To fill an awkward patch of ground outside the Colesbourne Motor Garage we've usually sown a mixture of hardy annuals to give a bright sumer show. This year we used Kings Cornfield Annuals, a mixture of once-common cornfield weeds, now almost totally eradicated by intensive agriculture. It's a reminder of how European cornfields must once have looked, full of annuals competing with the crop. The diversity in the mix is quite limited, but the result is spectacular, the only criticism being that poppies are rather sparse. These are the principal components, and some views of the mixture. In an online article published by The Browser.com ("Writing Worth Reading"), the well-known garden designer Arabella Lennox-Boyd recommends her top five books for inspiring gardening reading. They are The Education of a Gardener, by Russell Page; New Trees; In Your Garden by Vita Sackville-West; The Hillier Manual of Trees and Shrubs, and Gardens from the Air, by Franco Migliorini and Luigi Latini. I'm not familiar with the latter, but its a very interesting and original concept, and one to look into. It is an honour, however, to have my own book linked to those of Russell Page and Vita Sackville-West, and The Hillier Manual is an essential. Thank you, Arabella! The September issue of the RHS magazine The Garden sees a makeover in appearance and content, although it remains the same dimensions as before. 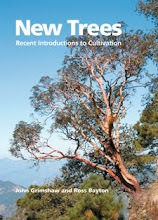 It was last subtitled Journal of the Royal Horticultural Society in 2008 and the transition from being the journal of a learned society to popular magazine is now complete. 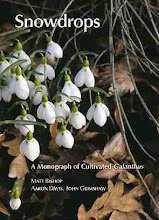 While I regret the loss of continuity in the title, I don't think it is a bad thing if a more contemporary look makes aspects of gardening more approachable: there is certainly a lot of useful information and some solid articles in this issue (I should say, including one by me, on autumn-flowering bulbs). I regret the sprinkling of advertisements through the body of the magazine, however, but understand the commercial imperative that is deemed to make this necessary (nobody looks at solid blocks of ads fore and aft), and perhaps in consequence many of the spreads seem rather 'busy.' No doubt we'll soon get used to it. One of the snippets in the 'News' section concerns the proposed new RHS plant hardiness ratings, intended to be introduced in their final form in 2013, following consultation, but this is their first public airing. The former RHS system, H1-4, was pretty hopeless and generally ignored, and this scheme, ranging from H1 (tropical) to H7 (the very hardiest), is intended to be more widely applicable. UK gardeners are invited to comment on it. One of the most important decisions to be made each year is when to cut the 'long' meadow ('long' as in long grass) It gives so much pleasure, from the first crocuses and snowdrops in February, through to now when there were still of flowers of Geranium pratense, Malva moschata, Centaurea nigra and Astrantia major. But they were comparatively sparse and had all set plenty of seed already, and the seed of other important species was ripe or had already been shed, including from the Iris latifolia that flowered so beautifully in June. As it was a bright and breezy day it wasn't difficult to decide to get it done this afternoon. A few years ago, while visiting Levens Hall in Cumbria, we watched the gardening staff mowing long grass with scythes and were very impressed by the cleanliness and quietness of the process. Intending to copy their example I acquired a scythe a few weeks ago, and this was its first proper outing. I got the mowing done, at the cost of three blisters and a stiff back, but it was distinctly haggled - I need practice! It probably took a little longer than doing it with the mower, but without the noise or hassle of restarting every few minutes, or clearing the blades, and the mowings fell as hay rather than mush﻿, so there are definite advantages. The Island Villa or 'Maritime Theatre' at Hadrian's Villa: probably the Emperor's private quarters. ﻿﻿One of our aims while in Rome was to get to Tivoli to see Hadrian's Villa and the Villa d'Este, so on Sunday, foolishly believing that public transport was unreliable, we booked a tour that would take us to both. It did, but that was the best that could be said of it. ﻿ Hadrian's Villa, now on the outskirts of Tivoli, must once have been among the greatest 'country retreats' the world has ever seen, a magnificent expanse of fine buildings and landscaping that in some ways can be seen as as a microcosm of the Roman Empire. Hadrian had a passion for art and architecture and here at his private villa he could indulge these with the resources of the empire behind him. Incredibly, the majority of the villa complex, stretching over almost a kilometre, was built within a decade of his accession, mostly while he was on tour of the empire, but evidently all to a single vision that must have been largely his own. With the buildings clad in marble it must have been an extraordinary place: even today, in ruins and stripped to the brick in all but a few corners, it is monumentally grand. The Canopus, an area said to have been inspired by Egypt, with a half-domed dining hall at the end of a long reflecting pool, once lined by sculptures and a colonnade. The current statues are all replicas. The massive remnants of Hadrian's Villa are still an imposing sight, in a wonderful setting﻿. After Hadrian's death the villa was maintained as an imperial residence for a while, but became neglected and eventually lapsed into obscurity, although forming a convenient source of building materials for the local populace. Its significance was recognised again in the Renaissance, when various prelates undertook excavations that unearthed a wealth of wonderful statuary and other objects, now scattered through the world's museums. Among these excavators was Pirro Ligorio, working for Cardinal Ippolito II d'Este (1509-1572), Governor of Tivoli from 1550, and then in the process of building his own remarkable and villa and garden that Hadrian's statues were to adorn. Among them was the statue of an Amazon seen to the right, a copy of an original by Pheidias that is now in the Capitoline Museum. Only fragments remain on site to show how magnificent Hadrian's Villa must have been: an intricately carved column base. The timeless Italian combination of olive trees and cypresses in the grounds of Hadrian's Villa. The gardens of the Villa d'Este are one of the greatest of Renaissance landscape creations, and have been admired and copied since they were built, principally between 1560-1575. Sited on a steep west-facing slope below the massive presence of the villa itself, they are a fantasy creation of fountains and pools, light and shade, formality and farce, warmth and coolth. With the exception of two unfortunate patches of bedding in Italian colours, there is little in flower at this time of year, but there doesn't need to be: the contrast in shades of green and the light from the stone and water is quite sufficient. Despite the formality and beauty of the layout and architecture, water is the thing at Villa d'Este, providing light, movement and sound. Its provision required the creation of an aqueduct from the mountains and a conduit from the River Aniene which runs through the town, but this constant supply at constant pressure enabled the Cardinal's fountaineers to develop dozens of water features, many of which are sadly no longer extant (including the water jokes, but the water organ has recently been restored). The statuary is long-gone, alas, and the garden and its features fell into disrepair from the late 17th Century. Now a World Heritage site and owned by the Italian state they seemed to be well kept, with crisply trimmed hedges of Bay, Box and Myrtle, and most of the important fountains are working well (though others need attention). All the elements of Villa d'Este are encompassed in the setting of the Fontane dell'Ovata. The famous Pathway of the Hundred Fountains - a beautiful combination of sound and light. The water features are all draped in a lush coating of Maidenhair Fern, Adiantum capillus-veneris, a nice sight for a pteridologist. The Organ Fountain is at the head of the main cross-axis of the garden, with its water flowing into the first of three fish ponds placed along the terrace. ﻿﻿Having been whisked round Hadrian's villa in an hour flat, and about to get the same treatment at Villa d'Este, we decided to abandon the tour and go back to Rome by bus and metro, an arrangement that worked smoothly and efficiently. It gave us the opportunity to explore Tivoli and the grounds of the Villa Gregoriana, where the gorge of the Aniene, with the river rushing through tufa grottos suggested where, perhaps, some of the inspiration for Villa d'Este, and almost certainly some of its tufa features, had come from. The Aniene gorge, below Tivoli. A lily among the acanthus: a capital at the Temple of Vesta, Tivoli. Bougainvillea and a random column. We have been in Rome for the weekend. These are a few more or less plant-related pictures, more to follow in the next few days. this is the source of culinary capers. Pinus pinea in the gardens of the Villa Borghese.